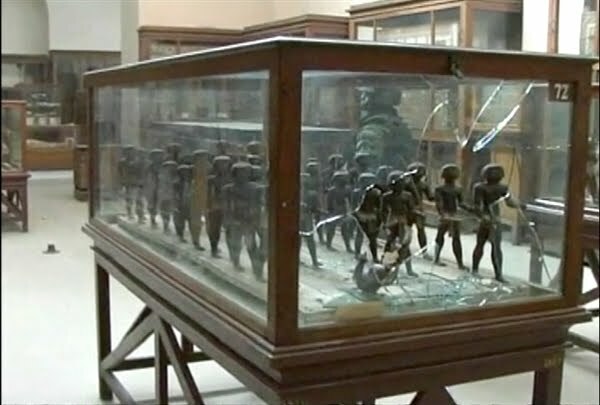 With the unrest in Egypt continuing over the weekend, the Egyptian Museum in Cairo is now "under military guard" (AP) in response to an attempted looting late Friday. 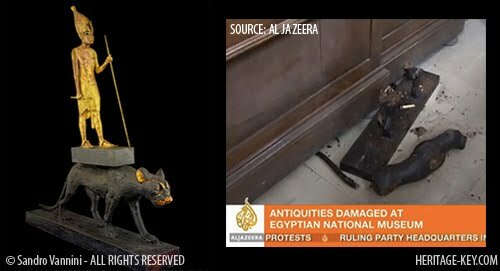 According to reports, nine men infiltrated the museum, decapitating two 3300-year-old mummies and damaging about 100 other artifacts. When the men were apprehended later that night, they were allegedly still carrying the skulls and a statue of Isis (TIME). Ultimately, nothing was stolen, but damage to the artifacts is still being assessed. 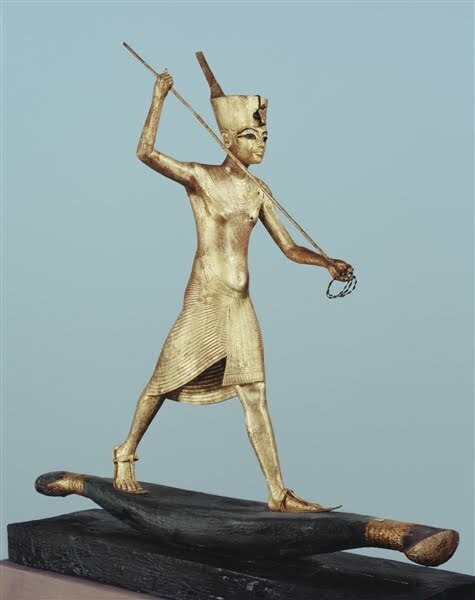 historically treat the civilizaton of Ancient Kemet with such disrespect. Is it Islam that does this? As black people we can't be mislead by broad labels and generalizations. Whethe r this attitude exists as a matter of orthodox faith or ethnic pride is difficult to determine, however it does not follow that an appreciation or understanding of Islam (peace) is or should be at odds with appreciating and understanding the spirituality of Kemet. It is also necessary to know the history of Arab or islamic contact with Egpyt as well. For the most part the early Islamic inhabitants in Egpyt admired the accomplishments of the great civilization they saw. A report that the Alexandrian library was burned by the Arab invaders during the 640s has been regarded as spurious by modern scholars. The fiction cannot be traced earlier than circa 1200, at a time when the trends in Islamic learning were changing for the worse, and the anti-scientific and anti-philosophical tendencies were mounting. The early administration of Islamic Egypt preserved the literary heritage of the country, including what had survived from the Alexandrian library, whose contents had been committed to the flames centuries before the coming of Islam. The Abbasid Caliph (r. 813- 833)Al-Mamun genuinely patronised learning, and he perhaps wished to gaze upon the fabulous maps of celestial spheres said to exist in a secret chamber. 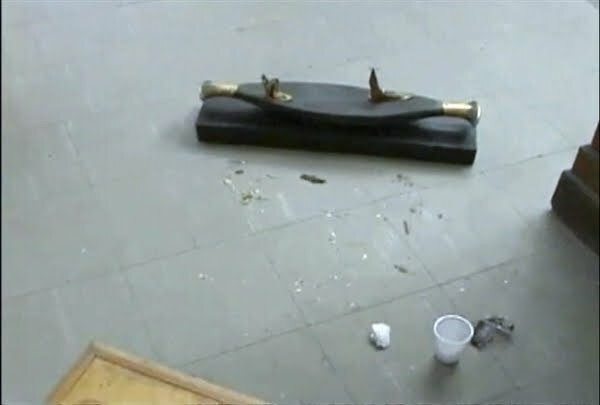 Though his men were able to force their way into the "King's Chamber," of the Giza Pyramid, the monarch was evidently disappointed with the result. Archaeologists have viewed Al-Mamun as commencing the habit of pillaging the Pyramids. Ancient monuments became a source for quarried stone, and the Giza Pyramids eventually lost their protective casing of limestone blocks, after an earthquake loosened the blocks. Those architectural components at Giza were appropriated by subsequent regimes and reused to construct the palaces of Mamluk and Ottoman Cairo. However, that was far in the future in the time of Dhu'l Nun, and he appears to have been genuinely concerned to understand the meaning of the resplendent architectural survivals visible along the banks of the Nile. 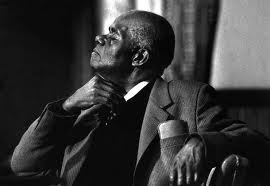 As once mentioned by late historian John Henrik Clarke, black people need to be in control of their own spirituality - no matter what form it takes. Dhu'l Nun was a prime example of such a man. 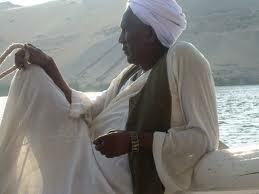 He was born at Akhmim (Ikhmim) in Upper Egypt, an ancient town on the east bank of the Nile. 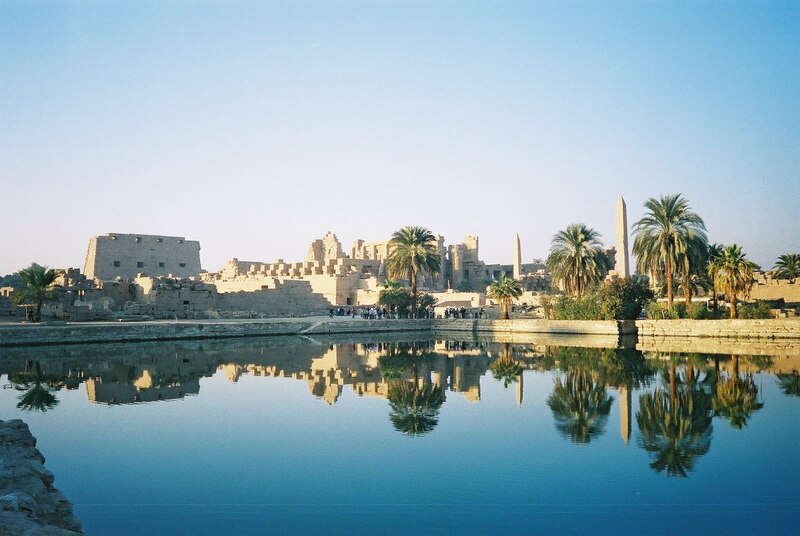 In Pharaonic times, Akhmim was a temple center of the fertility god Min. The Egyptian Muslim Dhu'l Nun traveled as an ascetic in Arabia, Palestine, and Syria. Dhu'l Nun was opposed by the Maliki jurists of Egypt prior to 829 CE, being condemned as a heretic for teaching on the subject of mystical experience. According to Professor R. A. Nicholson, he "was a Copt or Nubian". His father Ibrahim was a Nubian who had converted to Islam, becoming a master (mawla) among the Quraysh tribe from which Muhammad himself descended. 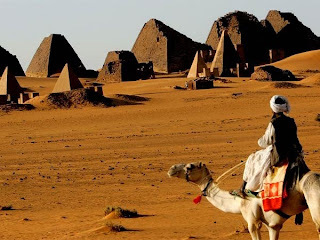 In brief, Dhu'l Nun was one of the Egyptian mawali, a native of the Nile valley who learned Arabic culture and language under Quraysh auspices. "Dhu'l Nun al-Misri al-Akhmimi, the ascetic, was a philosopher who pursued a course of his own in religion. He was one of those who elucidate the history of these temple-ruins (barabi). He roamed among them [the temples] and examined a great quantity of figures and inscriptions." Dh'ul Nun was apparently not content with the conventional Arab disdain for the ancient "idol-worshippers". He found it evident that the inscriptions on ancient monuments were an index to the sciences of antiquity. In the time of Dhu'l Nun, an ancient temple devoted to Min still existed at Akhmim. 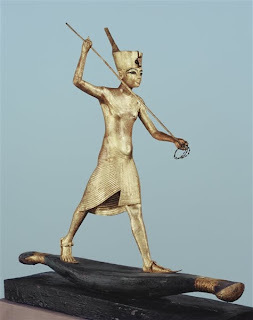 (Khem or Min, was the neter of reproduction; as Khnum, he was the creator of all things, "the maker of gods and men". As a god of fertility, he was shown as having black skin to reflect the fertile black mud of the Nile's inundation.) That edifice seems to have been of substantial size and in a good state of preservation; it may even have been as large as the Karnak temple complex so famous today. The Akhmim temple was not destroyed until the fourteenth century, the stone being used for local buildings. "He [Dhu'l Nun] professed the art of practical chemistry and alchemy and belongs to the same class as Jabir ibn Hayyan. He devoted himself to the science of the secrets (hidden phenomena -ilm u'l batin) and became proficient in many branches of philosophy (Hikma -wisdom). He used to frequent the ruined temple (barba) in Akhmim. And it is said that knowledge of the mysteries therein was revealed to him by the way of righteousness." It has been noted by historian Reynold A. Nicholson that "Sufism has always been thoroughly eclectic," he observed, "absorbing and transmuting whatever 'broken lights' fell across its path, and consequently it gained adherents amongst men of the most opposite views." The sources credit Dhu'l Nun with a large number of disciples in tasawwuf (Sufism). He was once asked "What is the end [objective] of the mystic?" The answer came: "When he is as he was, where he was, before he was." Dhu'l Nun al-Misri remains one of the most fascinating figures in early Sufism. * There is a recent claim that no mummies were actually harmed in the protests that have overwhelmed Egypt. 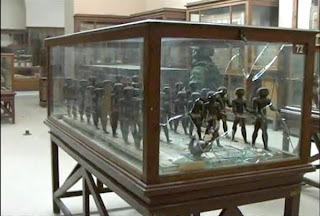 Officials in Cairo said on Monday earlier reports that a pair of 2,000-year-old mummies had been damaged by looters were incorrect. 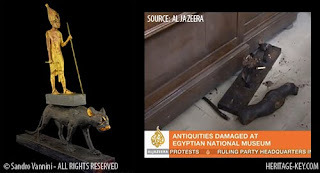 "They were not mummies," Egypt's top archeologist Zahi Hawass told the BBC. They were just "two skulls taken outside from the CT scan machine." Daily News, 2/07/11. Read more on Dhu'l Nun in "Inner Civilization: Redeveloping Black Culture and Civilization in America."